ℹ I will update this blog if necessary to reflect new developments. Links for other locations added. Feel free to mention missing sessions in the comment section. It’s that same time of the year again, SAP TechEd is just around the corner and its preparation is one of the hot topics at SAP right now! If you’re interested in getting a detailed understanding of SAP’s portfolio of solutions, platforms and technologies, and insights into their future direction, but also in putting your hands on the latest and greatest features and tools, then join us at the different SAP TechEd 2017 events all around the world. You’re looking for another reason why you should attend the SAP TechEd events? Then check out the SAP TechEd 2016 opening keynote in Las Vegas “Back to the future” from Björn Goerke, Chief Technology Officer (CTO) and President SAP Cloud Platform, SAP SE. Prior to the event you can also check out some of the ABAP highlights from SAP TechEd 2016! Let me now use this blog to draw your attention to some of the ABAP-related sessions (demo-rich lectures, hands-ons, road map Q&As, CodeJam mini-editions, …) concocted by experts from SAP and by the SAP community, i.e. mentors, customers and partners. 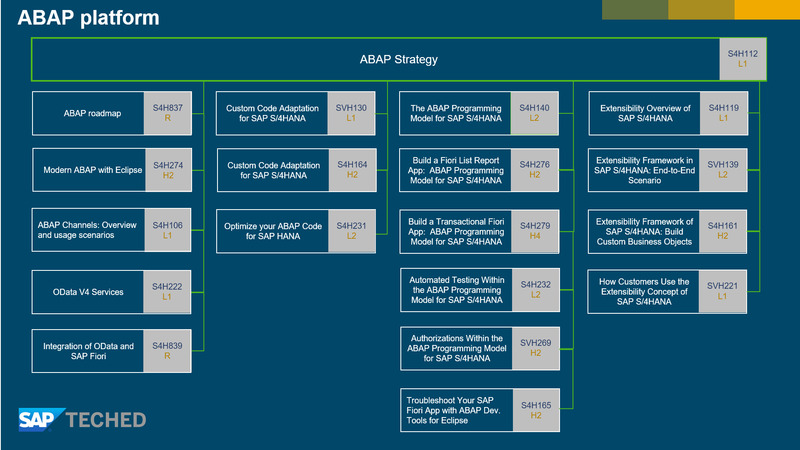 Here is a compact overview of the sessions provided by the ABAP platform team at SAP. Find more information and more sessions below. ABAP platform is the proven foundation for mission-critical business systems. It provides a solid and scalable platform and an effective development environment to build new, enterprise-ready business applications. Learn how these assets of ABAP are combined with the opportunities of business trends like cloud, user experience, and in-memory computing. Find out more about the role of ABAP platform in SAP S/4HANA. The ABAP platform provides the rock-solid and scalable foundation underlying SAP S/4HANA, the digital core. The platform continuously evolves to support new business scenarios and cutting-edge technologies such as SAP HANA, SAP Fiori, and the cloud. Learn about the major capabilities in ABAP 7.5x and get an outlook of the future versions of the ABAP platform. Traditionally, SAP NetWeaver has been the foundation and integration platform for SAP Business Suite applications. The go-to release, SAP NetWeaver 7.5, has been widely adopted. The successor versions, SAP NetWeaver Application Server for ABAP 7.51 and 7.52, serve as the foundation for SAP S/4HANA. Learn about the latest enhancements of SAP NetWeaver and explore the road map for the transition to SAP S/4HANA. Get an introduction in this hands-on session to the new ABAP language features that have been implemented since the release of 7.40 up to the latest ABAP release. All features will be explained and practiced using ABAP development tools (Eclipse based ABAP tools), and a short introduction to these development tools is provided. The focus is on expression-oriented language features and advanced, internal table operations. Take this opportunity to play around with the coolest features of the ABAP development tools for Eclipse. And learn lots of tips and tricks that will make your life as an ABAP developer much easier. ABAP channels facilitate real-time user experience within ABAP applications. Always up-to-date data on the UI, immediate reaction to events, collaboration, and direct communication between shop-floor devices and ABAP systems are made possible through native support of WebSockets, event-driven communication between ABAP sessions, and TCP/IP connectivity. Using many live demos, we demonstrate the purpose and major use cases of ABAP channels and the necessary implementation steps for developers. This road map session provides an overview of OData service development for SAP Fiori apps as well as recently released and planned innovations in 2017 and beyond. Learn how to access data in your SAP software systems using Open Data Protocol (OData). Find out where we are now and where we are heading for provisioning and consumption of OData services in SAP technologies, both on premise and in the cloud. Understand how SAP products that are currently in development are leveraging advanced OData V4 specific features such as cross-service navigation, filtering on expanded entities, and $apply. See how to develop an OData V4 service end to end using the latest release of SAP NetWeaver AS ABAP and learn how to develop services based on core data services (CDS) views and build develop a SAPUI5 user interface on top of them. Find out how to make the most of print forms and interactive forms using SAP Interactive Forms by Adobe software (on premise) and SAP Cloud Platform Forms service by Adobe (Adobe Data Services [ADS] on SAP Cloud Platform). We explain the overall strategy, continuous improvements, ADS on SAP Cloud Platform, and our cloud-only solution. Software can easily become complex and difficult to handle – join this session to learn techniques on how to manage and prevent this. You will see how test seams for ABAP simplify unit tests, even in legacy ABAP code with many dependencies. We will demonstrate an OpenSource tool to automatically generate dependency graphs and use it in projects, and the main technique for working with legacy code – writing a characterization test and using it as safety net while making changes. SAP S/4HANA includes a new development approach even for custom development applications – ABAP programming model for SAP Fiori. It includes a set of frameworks and tools and finally unifies the development approach to “The Principle of One,” including BOPF, BRF+, CDS, OData/Gateway, and SAP Fiori. Even if you aren’t deploying SAP S/4HANA yet, you can start to use it on the SAP NetWeaver technology platform. This will make your transformation a lot smoother – I will show why and how. Do you want to know what to do with your custom code when converting to SAP S/4HANA? Want to see the latest innovations in SAP development tools to analyze custom code? Then this lecture is perfect for you. Learn how to use ABAP tools like the test cockpit, the call monitor, and the SQL monitor to optimally adapt your custom code for SAP S/4HANA. And be well prepared for your journey to SAP S/4HANA. Do you want to know what to do with your custom code when converting to SAP S/4HANA? Want to see the latest innovations in SAP development tools to analyze custom code? Then this hands-on session is perfect for you. Play around with ABAP tools like the test cockpit to optimally adapt your custom code for SAP S/4HANA. And be well prepared for your journey to SAP S/4HANA. After a conversion to SAP S/4HANA or a migration to SAP Business Suite powered by SAP HANA, the next step for developers is to optimize their custom ABAP code to fully exploit the powerful capabilities of SAP HANA in their applications. Get an overview of the analysis tools, such as SQL Monitor, that are available for identifying promising candidates for performance tuning. Get to know existing code pushdown techniques like core data services and ABAP-managed database procedures. With the availability of the SAP HANA platform, there has been a paradigm shift in the way business applications are developed at SAP. Core data services (CDS) simplify and harmonize the way you as customer or partner can define, extend, and consume your data models to service your applications. Get the details on how to optimize the performance for CDS views by introducing redundancy, reducing complexity, and performing run-time optimizations. In this code review session, we assess a real code example and evaluate what is good and bad coding from a performance perspective. See an example of how to analyze and optimize a slow query on SAP HANA with the help of the plan visualizer, and get recommendations for an appropriate index design. In this code review session, we provide tips and tricks for getting good performance from core data services (CDS). We cover the principles of query optimization and give a detailed analysis of how to optimize performance for CDS views with filter pushdown. Get transparency about your custom code and modifications to prepare the transition to SAP S/4HANA. Visualize the custom code usage, quality, and impact. Understand the simplification of SAP S/4HANA and help ensure that the effort and scope will be optimized using SAP Solution Manager 7.2 capabilities with integration of tools such as ATC and UPL/SCMON. Hanson Australia has been creating “Z” code for close to 20 years and thus has a very large amount of bespoke functionality. By 2025 it will have to migrate to SAP S/4HANA and converting the Z code will be no small exercise. Walk through the various SAP tools available to analyze your current system and thus draw up an action plan for preparing “Z” code for the transition. Hear “real-world” examples of code as opposed to abstract theory. Join this overview session and learn more about how the ABAP back-end supports the development of highly standardized, cloud-ready, SAP HANA-optimized Fiori apps in SAP S/4HANA. You will understand how the new programming model combines recent and proven technologies like CDS, BOPF, SADL and SAP Gateway, and how aspects like authorizations and automated testing are handled. This session focuses on the back-end components, but also includes a quick look at the integration into the UI5 client technology. Learn how to write automated tests for the server part of your Fiori apps. This session starts with a basic introduction into how to write simple automated tests with ABAP Unit. Before it covers more advanced topics such as test-driven development, test double frameworks (ABAP, CDS, Open SQL) and test seams. The new ABAP programming model for building Fiori apps based on CDS-based data model and OData services allows to include authorization information directly into the data model. Find out how this can be done in a consistent way, from the start authorizations of services down to the authorizations on business data. Wanted: Developers to use the new ABAP programming model for building an end-to-end Fiori app! Get your hands on the latest ABAP features and build a List Report app with search capabilities. You’ll be working with core data services (CDS) and then expose the data using an OData service. Finally, you will enrich the CDS-based data model with UI annotations to generate an app using SAP Fiori Elements. Wanted: Developers to use the new ABAP programming model for building a Fiori end-to-end app! Get your hands on the latest ABAP features and build a transactional app with draft and search capabilities. You’ll be working with core data services (CDS), Business object processing framework (BOPF), then expose the data using an OData service. Finally, you will enrich the CDS-based data model with UI annotations to generate an app using SAP Fiori Elements. This mini CodeJam shows how to define and create core data services (CDS) on the ABAP platform that can be exposed easily through the OData protocol and consumed with template-based SAP Fiori apps. In addition, learn about advanced features such as transactional services with draft qualities. The ABAP platform comes with powerful programming frameworks that make a developer’s life much easier when creating SAP Fiori‒based UIs on SAP HANA. But what happens when the application is not doing exactly what you are expecting or when you just want to understand the ABAP logic behind an SAP Fiori app? Be prepared and learn in this hands-on session the latest features of the ABAP troubleshooting tools in Eclipse, like the new debugger, the new ABAP trace, and ABAP log points. The virtual data model based on core data services views is the cornerstone of the programming model in SAP S/4HANA. Core data services provide all metadata that are necessary to build analytical or transactional apps or even remote APIs. In this lesson you will learn how the virtual data model is structured and how to implement the different types of core data services views that are necessary to build analytical or transactional apps or remote APIs. How do you extend your SAP S/4HANA solution according to your specific needs? What are the flexible extensibility tools in SAP S/4HANA and SAP S/4HANA Cloud? Get insight into the extensibility concept: the powerful tools that support key users and developers in SAP S/4HANA and the extensibility capabilities you get using SAP Cloud Platform. With this overview, you are able to select your follow-up, deep-dive sessions of SAP S/4HANA and SAP Cloud Platform. You as a customer expect SAP S/4HANA to offer simple, modification-free extensibility. Explore the end-to-end process and the technology as we show the features of the extensibility framework in SAP S/4HANA and SAP S/4HANA Cloud. See how to add new fields; make them available in the UI, gateway, and core data services; add custom business objects including the UI; add business logic with the Web-based ABAP editor based on the SAP Fiori user experience; and perform sandbox testing and deployment. SAP S/4HANA and SAP S/4HANA Cloud offer simple, modification-free technologies to extend the standard functionality inside the ABAP stack. In this hands-on workshop, you create your own custom business object, add business logic using the Web-based ABAP editor based on the SAP Fiori user experience, define custom CDS views, use extended standard objects, generate the OData service, and add an SAP Fiori UI. These key-user extensibility tools can be used for SAP S/4HANA and SAP S/4HANA Cloud. With the extensibility tools of SAP S/4HANA, SAP offers a powerful flexibility and extensibility concept for your key users and developers in the cloud. Get an insight into how customers with SAP S/4HANA Cloud use the in-application tools and the integration to SAP Cloud Platform for their side-by-side extensions. From these customer examples, you can understand the flexibility of our extensibility options and get an idea how to use them for your business. The extensibility framework integrated in SAP S/4HANA provides an easy-to-use SAP Fiori app for lifecycle stability and modification-free extensibility. Using it requires following certain guidelines. We guide you through the techniques and coding we use to add new fields properly in the DDIC (data dictionary), gateway services, and core data services (CDS) views. We also show best-practice coding for taking legacy custom fields over to SAP S/4HANA and SAP Fiori apps. The extensibility framework integrated in SAP S/4HANA provides a simplified SAP Fiori app for modification-free extensibility, enabling customers to create their own business objects. We show how we use ABAP back-end tools for this purpose. The SAP Fiori UI uses smart templates that need the underlying view to be correctly configured using CDS annotations. We also show the on-premise use case for jump-starting your own business-object development. I hope I could arouse your curiosity… Join us at SAP TechEd 2017! In the meantime, you can watch the SAP TechEd 2016 highlights on the official web site. Here are also the ABAP highlights from SAP TechEd 2016 (blog). Awesome exciting times but madam you are still to provide videos for the s4/hana application development based on fiori. and u promised it last year. We uploaded a video recording from the last SAP TechEd which includes a live system demo (over 1h) showing how to build a SAP Fiori app based on the ABAP Programming Model in SAP S/4HANA from scratch. The demo starts around 42:20 and comprises the step-by-step development of a read-only Fiori list report app and its enhancement to a Fiori transactional app. Yes Carine, watched it a zillion times. But i wasnt the short cute informative videos like u posted for debugging AMDP etc, short to the point an dwell recorded without the extra drame from live demo stuff in parts. I’ll be there! I’ll be there in Las Vegas! My bags are packed. OK not really. But I’m really excited. Really you do miss a lot if you aren’t there in person. But of course not everyone has bosses or time to go! <Sigh> I wish all developers in SAP land could go. Once you get to the conference and breath that geeky air, look around and see people ready to learn, you will know what I mean. I love the sessions. I also love meeting people and talking with them. I think I’ll take a notebook with me. Us developers sometimes have business cards and sometimes not. Great! Hope to meet you there! Nice list! This certainly will make the ABAPers’ agenda building easier. The only thing I wish you would have noted is the presenter. Usually it plays a huge role for me. Paul Hardy is not to be missed this year. Not sure if this list includes his session or it’s just the official SAP content. As speakers may differ from one location to another, please click on the provided location links to read further details about sessions like speakers and related sessions. I intend to also list non-SAP sessions in this blog. @Everyone: Feel free to mention the missing ones in the comment section.